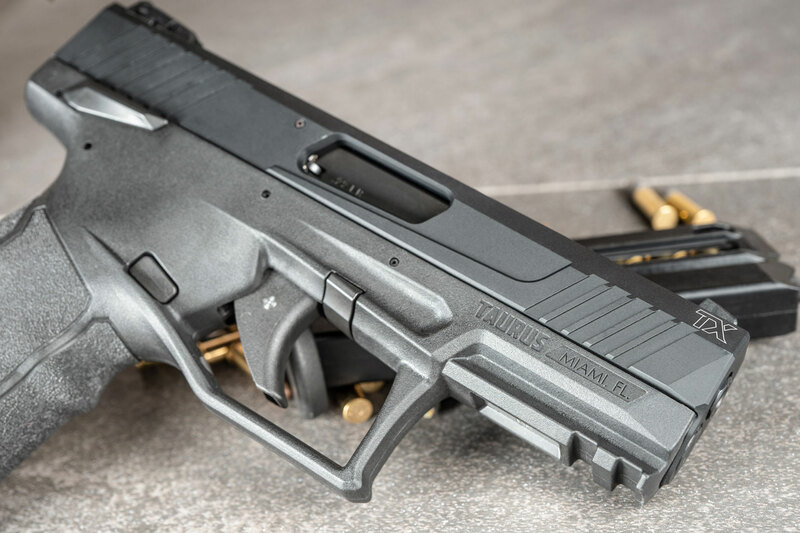 Taurus® continues its mission of delivering premium handgun performance and technological advancements to the shooting enthusiast market with the all-new Taurus TX22. The TX22 is a .22LR semi-auto that, out of the box, runs like a custom-tuned pistol but comes at a price point that puts a competition-level handgun squarely in the budget of the mainstream shooter. 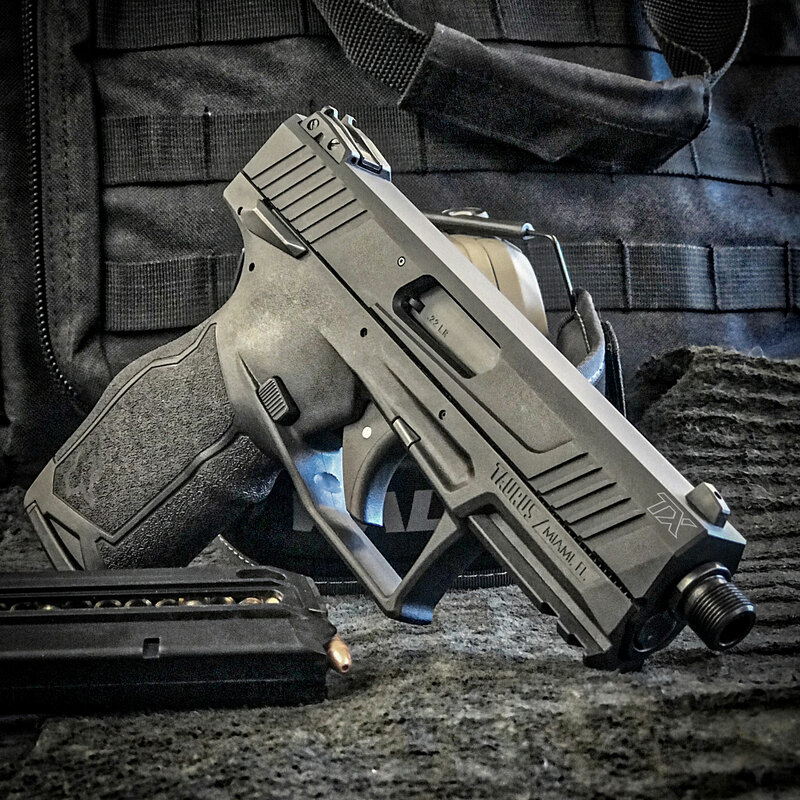 Designed and engineered from the ground up to maximize fit, function and comfort for shooters of all statures and levels of experience, the TX22 is a full-size polymer handgun that is ready from the outset to deliver success for competitive shooters as well as those just learning the art of pistol shooting. Boasting all the familiar features of larger-caliber semi-auto handguns yet in a rimfire chamber and with a class-leading 16-round capacity, the TX22 sets new performance standards and shooter expectations across the .22LR category. How do you achieve the pinnacle of handgun comfort, function and performance? You build the foundation around the shooter. From the start, Taurus designers and engineers placed ergonomics as the framework around which the new TX22 would be built. In fact, the "human factor" was integrated into every aspect of the development process. The grip, for example, was crafted over a two-year period to ensure optimal wrist alignment, control and overall conformity for all hand sizes. Operational ergonomics were also closely examined and tweaked for ideal positioning and size of the manual safety levers (safety lever is an optional feature on select models), slide catch and magazine catch/release to accommodate small- to large-frame shooters. Ditto for the trigger reach dimension. By allowing ergonomics to define the space envelope for the functioning parts—as opposed to allowing the operational components dictate size and positioning—the result is a full-size polymer frame handgun that is both comfortable and functionally efficient for a broad range of shooter sizes and shooting styles. The human factor does not, however, end at the TX22's advanced frame design. Take, for instance, the fire control assembly. Built around a single-action-only striker-fired system, the TX22 utilizes a short, 5 lb. trigger pull to release the sear—a feature that experienced and beginner shooters alike will appreciate. The trigger reset is also short and spring-assisted, allowing the shooter to deliver quick follow-up shots while maintaining good sight alignment. The audible trigger reset lets you know once the sear is re-engaged and the TX22 is ready to fire the next round. The recoil spring force is actually higher than most hammer fired .22s. Typically, a hammer fired pistol has a non-linear racking force. The initial force is high because you must rotate the hammer down. Once the hammer is fully rotated, the force substantially lightens to around 3 lbs. (for a typical .22). For striker fired guns, there is no hammer to rotate so the force is more linear. With the striker in the fired position, the force for the TX22 is roughly 8 lbs. for initial movement and 10 lbs. to full rearward position. 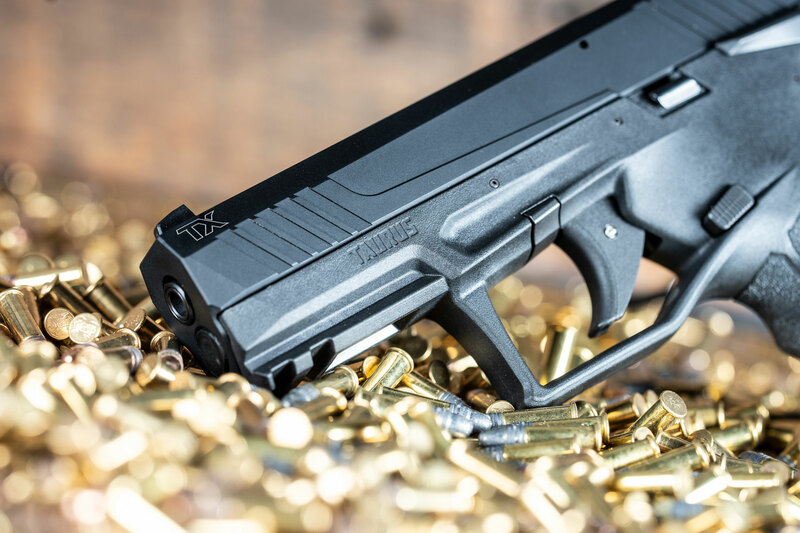 The TX22 is built on an advanced polymer frame intended to maximize fit and biomechanical geometry while minimizing bulk and weight through a combination of careful material selection, advanced manufacturing processes and strategic lightening of non-critical components—ensuring the overall weight of the pistol was kept to 17.3 oz. The grip itself is generously covered with a proprietary texture pattern that ensures positive hand placement and retention without overly aggressive stipling, which can be uncomfortable for beginning shooters during long range sessions. A finger groove beneath the trigger guard and one above the magazine floor plate further aid in providing a solid, confident grip. Ergonomics were also factored into the slide. Constructed of 7075 aluminum and finished in hardcoat anodized black matte, the TX22 slide includes front and rear precision-machined serrations for no-slip operation when chambering or ejecting a cartridge. 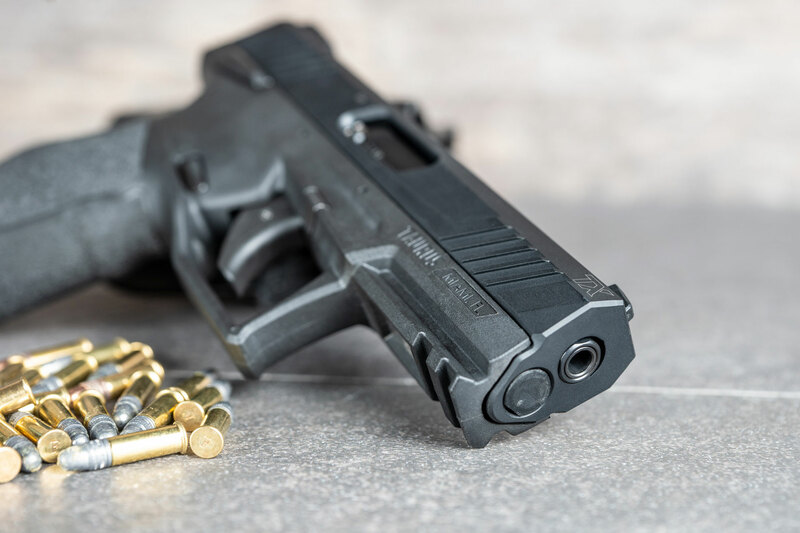 As a handgun developed for use by experienced shooters and those just starting to develop their handgun skills, the TX22 is replete with safety considerations. The manual safety (on select models) is ambidextrous to work with left- and right-hand shooters. 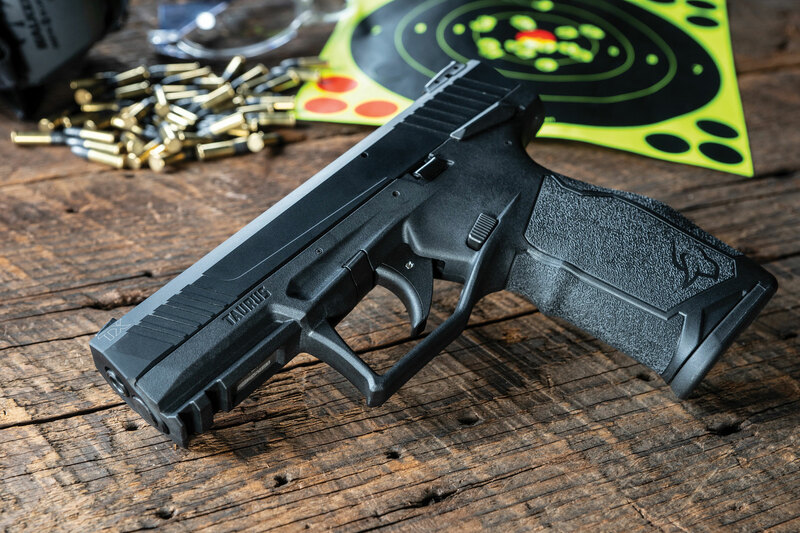 All of the TX22 pistols also have a hidden trigger safety that prevents unintentional rearward trigger movement. 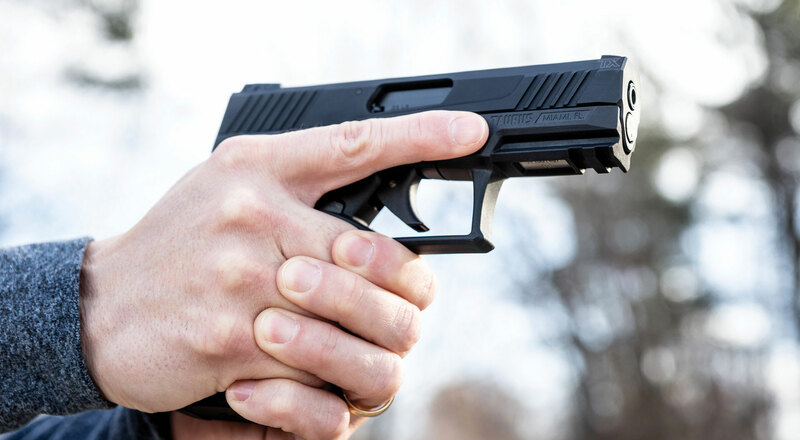 One of the key benefits of this design is that it leaves the trigger face "clean" by eliminating the conventional-style protruding trigger safety blade. Additional safety components include a firing pin block that prevents the firing pin from striking the cartridge unless the trigger is intentionally pulled. Popular handgun accessories can also be integrated into the TX22 platform. Blended into the frame is a MIL-STD-1913 accessory rail suitable for mounting a tactical light or laser. For those who wish to shoot suppressed, the 4.1-inch barrel comes with a 1/2x28 thread adaptor suitable for accepting popular suppressor models from AAC, Gemtech, SilencerCo, SWR, Q, and YHM. There is also a thread protector that goes on the barrel when the suppressor adaptor is removed. 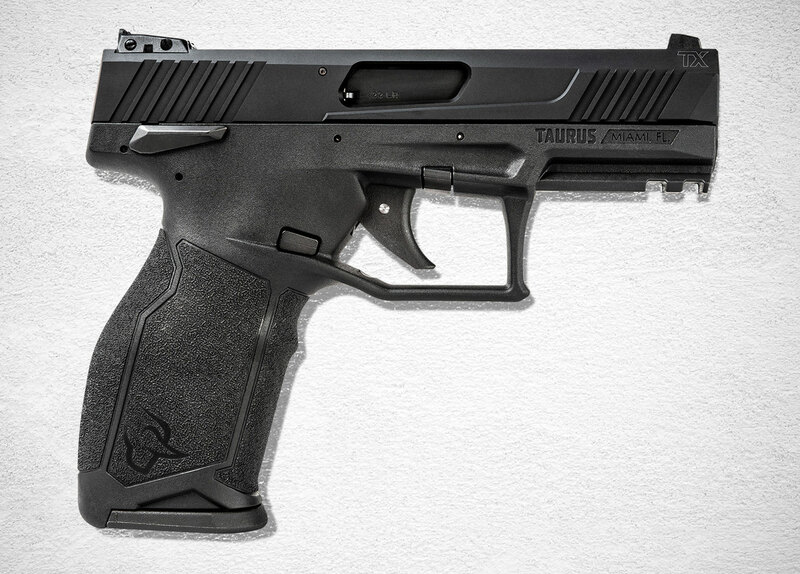 The new Taurus TX22 design was intended to satisfy the needs of shooters of all sizes and experience levels without compromising in any area. In other words, the TX22 is a pistol that meets the expectations of competitive-level shooters while providing the ideal platform for smaller-framed and beginning shooters—doing so at a viable price point that fits every budget. Although the TX22 is based on a full-frame design, the grip ergonomics, trigger dimensions, and size and placement of the operational controls make it the perfect training foundation for those just getting into pistol shooting—allowing them to become familiar with semi-auto pistol function and to develop their shooting skills before moving on to larger-caliber models. For experienced and competitive shooters, the TX22 hits all the "must-have" marks in terms of comfort, geometry and operational speed so essential for success. "The TX22 is impressive because it’s truly ready to go from the factory," states Taurus Team Captain Jessie Harrison. "Being able to purchase a pistol that requires zero modification and is match-ready is most appealing as a competitor." Count the virtually non-existent recoil, minimal sight alignment disturbance, adjustable sight and generous 16-round capacity as bonuses. 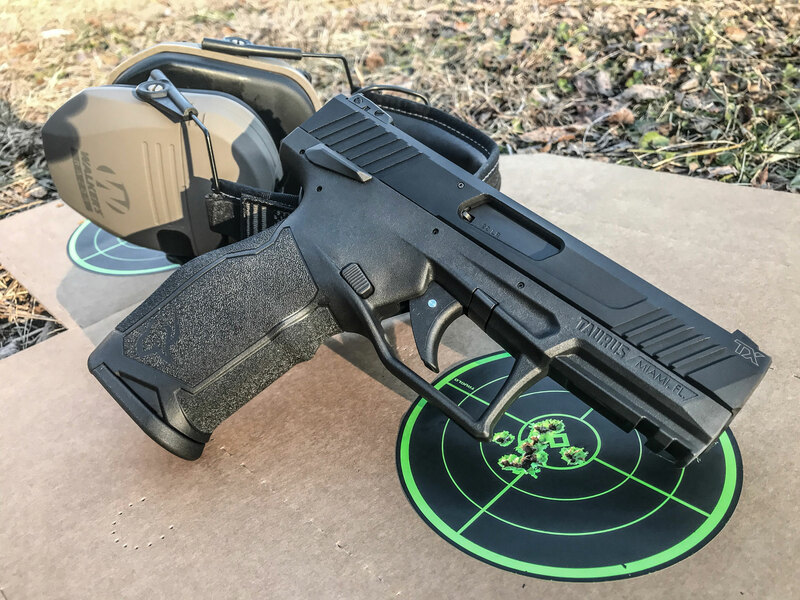 The Handgun That Invites You to "Keep Shooting"
Whether a first-time shooter or a range pro, all agree that the TX22 is one handgun you're reluctant to put up for the day. The comfortable grip and smooth operation combined with the .22LR chambering makes for a pistol that won't wear you out during extended target sessions. Add in the accuracy quotient courtesy of the short and relatively light trigger pull, barely perceptible recoil, robust magazine capacity and lightning-fast sight alignment—not to mention the overall confidence gained from accurate, controlled shooting and ease-of-use—and you have a handgun that invites you to "keep on shooting." © 2019 Taurus USA. All Rights Reserved.